One casual look at Abbas-Mustan and you can never believe that these 2 brothers are veteran Bollywood filmmakers. If forced to believe, then the first guess would be that they might be directing some social dramas or family stories. But one can never imagine in the wildest of their dreams that these 2 simple men, always found dressed in complete white attire, have delivered so many fast paced edge-of-the-seat musical action thrillers filled with suspense, glamour and comedy. 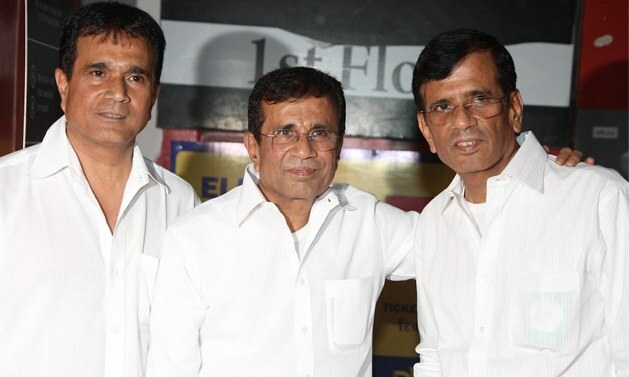 Abbas Mustan are quite unlike most real-life twins. They live in a joint family along with their third brother Hussain (who edits their movies, also dresses in white) and to everyone’s surprise all the three are always on the same page as far as their thought process and film-making is concerned. Their humbleness and simplicity is a stark contrast to their stylized sharp films with gray, complex characters filled with ambition, arrogance and attitude. There is no hit formula in Bollywood but there is definitely an Abbas-Mustan formula and they are following it successfully for the past 23 years – A multi-starrer plot (mostly a Hollywood rip-off), filled with twists and turns, shot in stunning locales of the world, a big star in negative role, glamorous heroines, chartbuster music and a parallel running comedy track. Indeed, the director duo of Abbas Mustan have carved their niche in the world of filmmaking in Hindi cinema by using speed as the channel vehicle to deliver the content to the audience. Their latest offering Race 2 is well on course to become the first 100 crore grosser of 2013 and its success has further stabilized their position as the best action-thriller makers in the current era. Baazigar: The film that fetched Shahrukh Khan his first Filmfare Award for Best Actor! Based on Hollywood’s ‘A Kiss before Dying’, Baazigar was the fourth biggest grosser of 1993. It started the trend of leading stars appearing in negative roles. Soldier: Soldier, the 5th highest grosser and the biggest action movie of 1998, took Bobby Deol and Preity Zinta to the top league. Soundtrack composed by Abbas-Mustan regular Anu Malik was a key element in the huge success of the movie. The film was remade in Tamil by Prabhudeva. Race 1 and Race 2: In the Race series, Abbas Mustan have taken their genre to another level with multiple lead characters having grey shades and twists coming every now and then. Race was the 4th biggest hit of 2008 and the sequel is the first big hit of 2013. Humraaz: Starring Bobby Deol and Amisha Patel in the lead, Humraaz had Akshaye Khanna in a negative character for the first time. The movie had a few brilliantly composed tracks by Himesh Reshammiya and it eventually went on to be the 4th biggest grosser of 2002. Aitraaz: Based on Hollywood flick Disclosure, Aitraaz fetched the Filmfare Best Villain award for Priyanka Chopra. Also featuring Akshay Kumar and Kareena Kapoor, Aitraaz released during the festive season of Diwali 2004 along with Yash Chopra’s Veer Zaara and the coloured version of Mughal-E-Azam. A few other noteworthy films by Abbas-Mustan are Khiladi (now synonymous with Akshay Kumar), Ajnabee (Akshay in a negative role) and Chori Chori Chupke Chupke (first and only non-thriller family drama by Abbas-Mustan). Which is your favorite Abbas Mustan movie? Vote now and discuss in the comments section below. Baazigar, Race were the best thrillers of bollywood. Khiladi and race r the best bcoz they r the brands now and their sequels have done well. y srk fans hav to always vote fr srk movies evn wen d poll is abt sumthin else ?? @Velocity bcozz srk’s movies r really gud…. N believe it or not it wazzz a gr8 movie. Akshay Kumar Completes Staggering 2000 crore at Box Office in his Career. Akshay Kumar has become the first actor in Bollywood to complete a staggering 2000 crore in his entire career. Yes you have read it right. It is not Salman Khan, Shahrukh Khan, Aamir Khan or even Amitabh Bachchan, but it is the king kumar who has set this unprecedented record. m nt sayin baazigar was bad, yes it was vry gud thriller bt dat doesn’t mean oder films of abbas mustan r bad !! humraaz,ajnabee,race etc were awesum too , personally my fav thriller was race part 1 , bst movie of abbas mustan acc to me ! m nt against khans, aamir khan is one of my fav ! its jst dat i dnt lyk wen srk n sallu fans always keep praisin dem evn wen d article is nt abt dem !